Meet two great friends of ours: Cory and Lisa, AKA Dig The Kid. When we first heard the duo on a hot summer day at a Jam In The Van concert in LA, we could tell there was something special about this deeply Californian band. Their music is uplifting yet thoughtful and they stole the show with their very first chord… then we heard ‘LOVE’ and we knew a partnership would be perfect! Over the course of many meetings (and several cocktails) with Dig The Kid, we discovered a shared love for quality, fun and, above all, family. 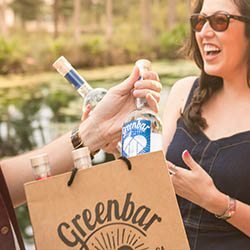 We have a natural affinity and adding their distinct voice to the Greenbar Distillery tribe is an honor. 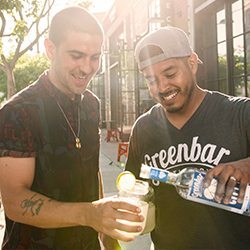 Dig the Kid is excited to partner with Greenbar Distillery because music and spirits go hand in hand. 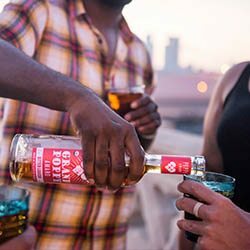 Both Dig the Kid and Greenbar Distillery share a common outlook: we turn heads and break new ground. Whether it’s keeping the party going from behind the bar or up on stage, our colorful, organic blend of songs and spirits make the perfect match. Listening to the band talk about the evolution of their songs and the detail they put into every element is awe-inspiring. Cory even took the time to learn Madagascan for one of their upcoming releases. The attention to detail is evident and it’s another area where we have a natural connection. We all agree: taking the hard path often leads to better results. We’re grateful to have gained a new family and are already working on fun collaborations. What better way to combine the two greatest industries of all time! 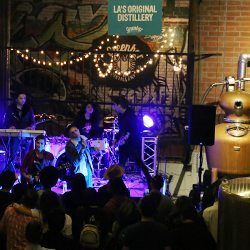 Greenbar Distillery supports the Los Angeles music scene as part of its ongoing connection to the LA Arts District and maker movement. We happily pour with KCRW, Sound City and support local bands and music venues. We’re committed to working with Californian artists who bring creativity and innovation to the City of Angels. Listen to more of our favorite Dig the Kid tunes via Soundcloud.